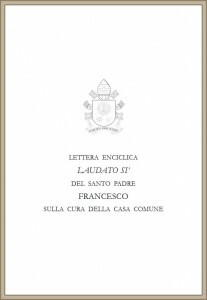 The encyclical Laudato Si’ (Praised be) on “Care for our common home” recently released by Pope Francis has been one of the more awaited encyclical in recent decades. Media from all over the world have been commenting on it before it was officially presented, as soon as it was leaked to the Italian media and after its presentation in the Vatican. Although Pope Francis had already signed another encyclical (Lumen Fidei in June 2013), Laudato Si’ is seen as the first encyclical of this Pope. Why? On the one hand because it seems Lumen Fidei had been almost finalized by the previous Pope, Benedict XVI. On the other because from the title, taken from the beginning of the Canticle of the Creatures of Saint Francis of Assisi’s (who will be a continuous reference along the encyclical) and the personal commitment shown (“My appeal”, paragraphs 13ff), it reveals key concerns of Pope Francis. The concern for caring for creation is not new in Pope Francis. Let’s remember that “protection” was the theme of the homily at the mass when Pope Francis inaugurated his pontificate on 19 March 2013, the festivity of Saint Joseph (who will be mentioned in Laudato Si’ para 242). At the homily he extended this protection to the whole creation: “let us be ‘protectors’ of creation, protectors of God’s plan inscribed in nature, protectors of one another and of the environment”. Furthermore he said, “whenever we fail to care for creation and for our brothers and sisters, the way is opened to destruction and hearts are hardened”. And he relates this protection with his ministry, “to protect the whole of creation, to protect each person, especially the poorest, to protect ourselves: this is a service that the Bishop of Rome is called to carry out, yet one to which all of us are called”. With Laudato Si’, Pope Francis puts into practice this service of the Bishop of Rome. In collegiality with bishops all over the world, Catholic Bishops Conferences will be quoted once and again in the encyclical. 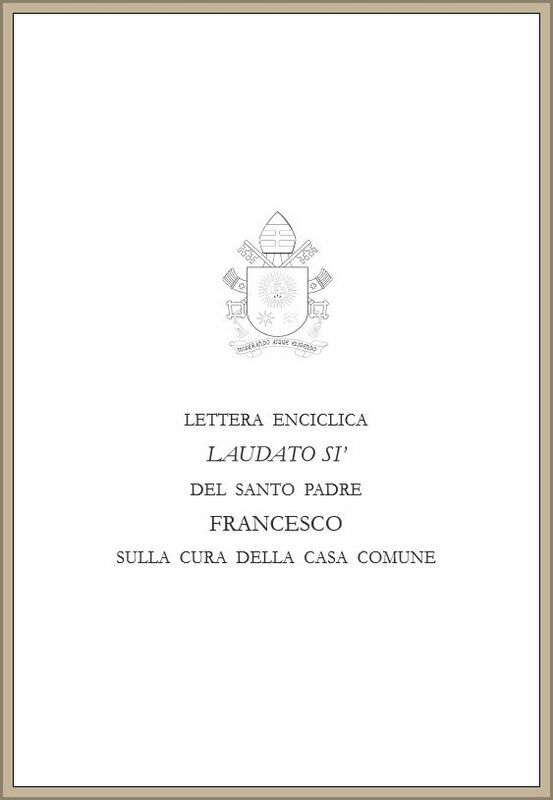 I invite you to read the encyclical. I am sure you will enjoy it. In fact, as the Pope reiterates several times, it is an invitation to a dialogue to all (not only Catholics), “so that together we can seek paths of liberation” (para 64). On the coming paragraphs I will give you some insights, from my personal view, that may help you in reading it. The encyclical has six chapters and 246 paragraphs. I put into brackets references to them in case you want to go to these parts directly. What is happening to our home (See) stresses some of the expressions of the ecological crisis: pollution, climate change, water crisis, loss of biodiversity. All these are intimately connected with poverty and inequality. Once and again the Pope will refer to the poor, the abandoned, the excluded. The cry of sister earth should be listened together with the cry of the abandoned of the world who plead for change (para 53). The ecological crisis is so complex and it has so many causes that we need to look for a response being respectful of various approaches and wisdoms (Judge). To do so, science and religion can enter into an intense dialogue which would be fruitful for both (paras 62-63). Christians need to contribute to this search based on their own convictions, where theology of creation plays a key role (paras 65-100). An effective response to the crisis needs to address especially the technocratic paradigm (paras 106ff), the excessive anthropocentrism (paras 116ff), the financial and economic system (paras 189ff) which are depleting the earth and deepening inequalities. An integral ecology (paras 137-162) is proposed to respond to this crisis. This is based on the various dimensions of ecology (biological, social, human), the principle of common good and takes into account especially the responsibility towards future generations. These perspectives call to urgent action (Act). This one implies changes in our personal lifestyles (para 203ff) and also in local, national and international policies (164-181). Regarding the latter, while recognizing the advances been made on some aspects, with the Basel Convention on hazardous wastes, the Vienna Convention and the Montreal Protocol on Substances that Deplete the Ozone Layer (168) the Pope affirms that progress made on the Climate Change Convention is regretfully very limited (169). The last chapter of the encyclical focuses on education and spirituality. These two are crucial to carry out the radical change, the conversion the world needs. In order to develop a deep spirituality of creation the Pope quotes Catholic mystics, among them Saint Therese de Lisieux (230) and Saint John of the Cross (234). He has previously quoted Teilhard de Chardin (note 53) and, as we said earlier, Saint Francis of Assisi as a leit motiv. Other interesting citations in this chapter include references to the Earth Charter (207), an international ethical framework on sustainability and to ninth century Muslim mystical writer Ali-al-Khawas (233). If all along the encyclical Pope Francis wants to be in dialogue with all people, and not only Catholics, special reference is made to other Christian churches and communities who have expressed deep concern and offered valuable reflections on the ecological crisis. To give an example Pope Francis quotes the Ecumenical Patriarch Bartholomew who has for decades drawn attention to the ethical and spiritual roots of environmental problems (paras 8-9). The presence and comments of Metropolitan John Zizioulas as representative of the Ecumenical Patriarch at the presentation in the Vatican show the ecumenical outreach of the encyclical. The encyclical ends with two prayers: A prayer for our earth and a Christian prayer in union with creation. Action and prayer, Ora et labora, as Saint Benedict of Norcia proposed (para 123), essential dimensions of integral ecology. Guillermo Kerber coordinates the work of the World Council of Churches on Care for Creation and Climate Justice. He serves at the board of the International Catholic Centre of Geneva as treasurer. No Comments to "An introduction to Laudato Si’"